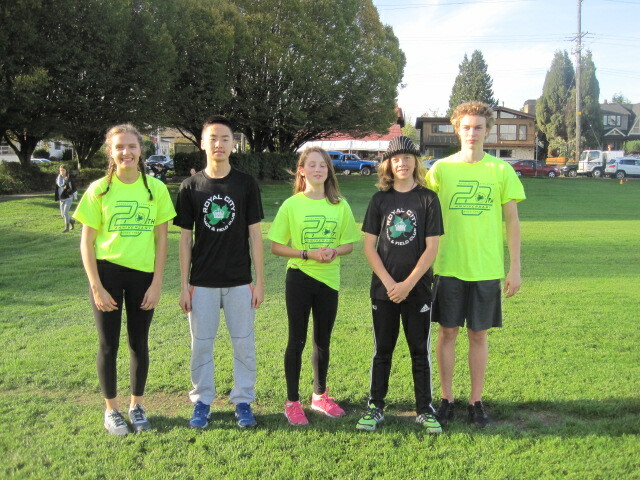 Emily Chilton, Gavin Fan, Emma Dolman, Ryan Jensen and Finnley Cookson volunteered at the recent New Westminster School District XC Elementary Championship. The Royal City Track and Field Club hosted the recent New Westminster Elementary School District XC Championship at Moody Park. About 80 kids in grades 3-7 from 6 different elementary and middle schools turned out to race in their age group. Thanks to Coach Sean Dixon and Jason Delasalle for planning, supporting and heading up the event on site, as well as several RCTFC parents for their roles at the finishline and along the course. A special thanks to Emily Chilton, Emma Dolman, Gavin Fan, Finnley Cookson and Ryan Jensen for volunteering their time and talents as rabbits and turtles in the races and for cheering on and motivating the younger children in general.